In the design process we seek to extract maximum value from both sides of any contradiction." Designing this effect was one of the toughest challenges I've ever worked on. I knew exacdy what 1 wanted to achieve. At first, however, my goals seemed impossible—or at least, irreconcilable. That's probably why none of the previously published versions of this plot had achieved them. It was very satisfying when I finally arrived at my goals and far more satisfying still when I found how strongly the effect plays with lay audiences. For those who might be interested. 111 outline my thinking on the subject. Put simply, I wanted a Follow the Leader routine that contained a lot of magic, was highly convincing, and had a strong climax. The two seminal routines in the Follou> the Leader plot are the Vernon routine from Greater Magic and the Mario routine from The Cardician. The Vernon routine is convincing but doesn't involve much magic because you only exchange packets a couple of times. Since this is a transposition effect, the amount of magic is a function of how many times you exchange the packets. If you switch packets once and turn over three cards from each packet (as in the Vernon version), you have only one magical phase. If you switch packets three times and turn over one card each time, you have three magical phases. Obviously, the latter is more amazing. It's also far harder to achieve convincingly. By contrast, the Mario approach involves exchanging the packets many times. Unfortunately, it does so by using a variety of swindles. 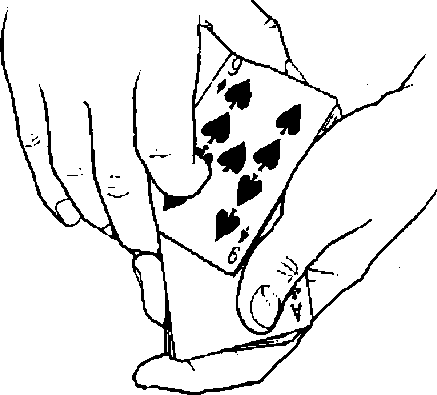 Swindle methods in card magic usually rely on confusion, either confusion of identity, as in the Gemini count, or confusion of position, as in the cross-cut force. Used sparingly and strategically, such ploys con be powerful. What limits the value of confusion-of-position swindles, however, is that they're often deceptive but seldom convincing. They are therefore most useful in achieving ancillary goals that are not central to the effect's conviction. Of course, in Follow the Leader, the positions of the two packets are the central issue. Furthermore, when swindles are used extensively within one routine, the danger is that confusion as a method can produce confusion as an effect. In a trick where absolute clarity about the positions of the packets is critical, trying to confuse the audience about the positions of those packets (as opposed to truly deceiving them about those positions) is self-defeating. You can probably succeed in confusing them, but can you keep them from realising they're confused? Virtually every version of Follow the Leader has adopted either the Vernon approach of strong conviction but little magic or the Mario approach of much magic but litde conviction. The challenge, 1 felt, was to reconcile the two. The breakthrough for me was the idea of using the Hamman count. This meant 1 could create an inner reality drastically different from the outer reality, yet the audience would be strongly convinced that nothing had happened yet. With most of the dirty work done early, the packets could be cleanly and repeatedly exchanged. Another seemingly intractable problem posed by this plot is that of diminishing scope. Perhaps the most fun damental principle of dramatic construction in magic is that things should get more amazing as the effect progresses, the most amazing being saved for last. One way to achieve this is to increase the scope (i.e., the sheer size of the magical phenomenon) with each phase. Unfortunately, the nature of Follow the Leader is that the scope diminishes with each phase. Each time you exchange packets, the packets are smaller. Therefore, by implication, fewer cards are magically transposing. This is why most Follotu the Leader effects end with a whimper. By the nature of the plot, the climactic phase has the least scope. I decided that, if I couldn't create a climax through increased scope, the answer would have to be increased conviction. If the last phase were the most convincing, it would also be the most amazing. It was only when I had the breakthrough idea of climaxing the effect with the last four cards rather than two that the answer hit me. Daley s Last Ace Trick is an ultra-convincing color transposition that proved the perfect climactic phase.